These are the results from Hastings Magistrates’ Court for September 12 to September 19. Michael Tindall, 60, of Whatlington Way, St Leonards, indicated a plea of guilty to attempting to engage in sexual activity where he could be observed by a child under the age of 13. The offence took place at St Leonards. He also indicated a plea of guilty to intentionally engaging in sexual activity, where he could be observed by a child under the age of 13, at St Leonards on September 9, 2017, contrary to the Sexual Offences Act 2003. He was committed to Lewes Crown Court for sentencing on October 10 and released on bail on the condition that he does not use any computer or device capable of accessing the internet; not to be in any household with a female under the age of 18, unless with the permission of Child Services, and not to have any unsupervised contact or communication with children under the age of 18, other than approved by Social Services. 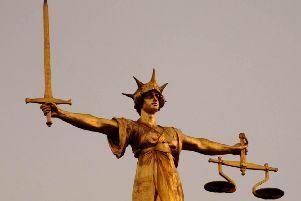 Gordon Hailwood, 42, of Oakwood Hill, Dorking, Surrey, pleaded guilty to assaulting a woman by beating her. The offence took place at Ticehurst on March 3. The court made a community order with a requirement of 250 hours of unpaid work. Magistrates also made a restraining order and ordered him to pay £300 in compensation. Max Holmes, 18, of Mitcham Road, Croydon, Surrey, pleaded guilty to assaulting a police officer. The offence took place at St Leonards on July 31. He was fined £50 and detained in the courthouse for a period. Daniel Simmons, 31, of Marina, St Leonards, pleaded guilty to driving a Mercedes C200 car dangerously on Durban Road, Bognor Regis, on May 3. He also pleaded guilty, on the same date, to failing to stop for police and failing to provide a specimen of blood for analysis when required to do so by police under the Road Traffic Act 1988. In addition, he pleaded guilty to driving with no licence or insurance on the same date. He was sentenced to 12 weeks in prison, suspended for two years. The court made a community order, with a requirement of 90 hours unpaid work, and banned him from driving for two years. Magistrates said the reason for the sentence was that the offence was serious as it involved a police chase at excessive speed and poor driving, in a built-up area. Terence Bailey, 31, of Priory Road, Hastings, pleaded guilty to driving a Ford Transit on Sussex Road, St Leonards, on September 1, while over the drink drive limit. He gave a breath alcohol reading of 43 microgrammes. The legal limit is 35 microgrammes. He was fined £75 and banned from driving for one year. Darren Cox, 42, of Elphinstone Road, Hastings, was convicted of assaulting a woman by beating her and causing damage to the front door of a property. The offences took place at Canterbury on December 17 last year. He was sentenced to six months in prison, suspended for two years. The court made a community order with an alcohol treatment requirement and made a restraining order. He was ordered to pay £450 in compensation and £600 in prosecution costs.